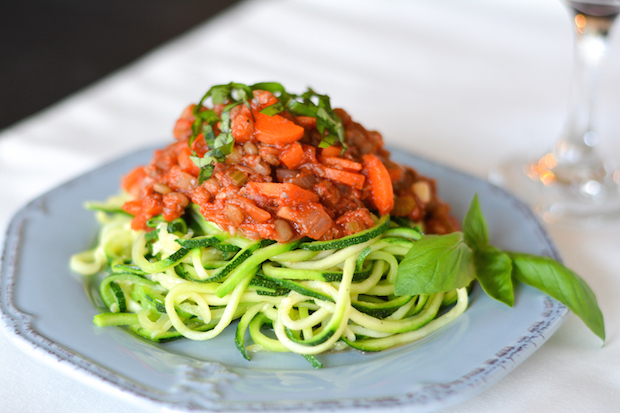 Spiralized zucchini noodles are topped with a vegan bolognese sauce “beefed” up with lentils and finely chopped mushrooms. It’s so yummy, you won’t even miss the meat! For today’s recipe I’m going back to plants. Because plants are delicious. And every once in a while, you just need to forget about meat and cheese, and eat copious amount of delicious, healthy things. Plants are delicious AND healthy. A few months ago, I started experimenting with plant-based meals that I thought I could get Nick to eat. I made these Black Bean and Kale Enchiladas with Avocado Cream (twice!) and they were a huge hit. Then I made BBQ Chickpea Bowls with Avocado Cream. Can you tell we really dig avocado cream? So then the question was, is it possible to make something plant-based without delicious, creamy avocados? Turns out, it is! I made this amazing bolognese sauce with lentils and finely chopped mushrooms. The combination was hearty and meaty, and you really didn’t even miss the traditional ground beef! You could definitely serve this on top of regular pasta, but since summer is winding down, I decided to take advantage of the end of zucchini season and make some zoodles. Nick loved this dish, and so did I. It was comfort food you don’t have to feel guilty about eating. This one will definitely be going in our regular rotation!! Place mushrooms in a food processor. Pulse until they are finely chopped. Set aside. Heat 1 tbsp olive oil in a large saute pan over medium-high heat. Add the spiralized zucchini and cook, tossing frequently, until just barely tender, about 3 minutes. Transfer to a colander over the sink to drain excess water. In another large saute pan (or dutch overn or large pot), heat remaining olive oil and red pepper flakes over medium heat. Add onion, carrots, celery, garlic and chopped mushrooms. Saute until beginning to soften, stirring frequently, about 7-8 minutes. Add crushed tomatoes, balsamic vinegar and oregano. Season to taste with salt & pepper. Bring to a boil, then reduce heat and simmer 10 minutes. Return zucchini to a hot pan for a few minutes to heat through. Serve zoodles topped with sauce and fresh basil. Love zoodles? Check out my Pad Thai Zoodles recipe! Mmm I love this “plant” recipe, Jess! I have yet to try zoodles, but they look SO good! What a great idea to pair it with this bolognese. Sounds hearty and healthy! Love it! Ahhh! 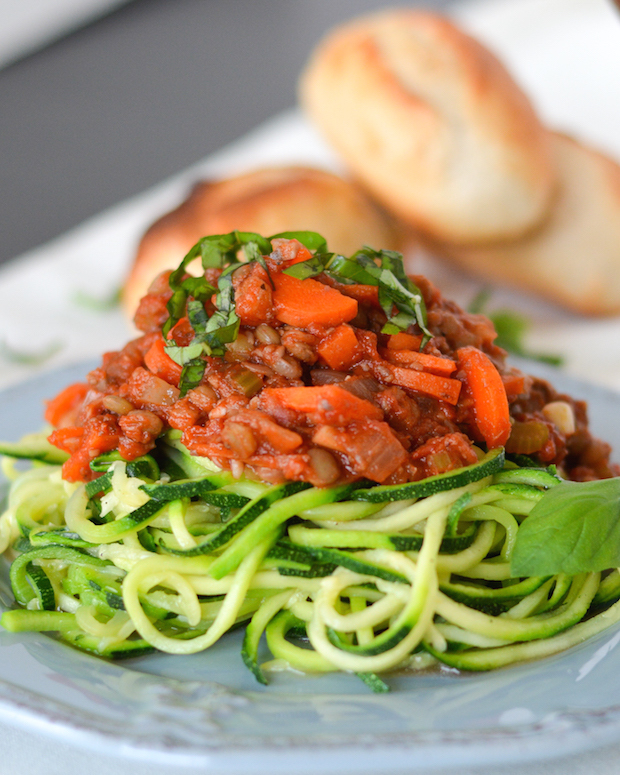 You have to try zoodles!! They’re so yummy and even the hubs is obsessed! I love what you did here, Jess! You just made a plant recipe that’s every bit as hearty as one with meat, and that can be tough! I love zoodles, and this sauce looks fantastic! This is amazing! I love how healthy it is. My mom is vegan, and I just emailed her this recipe. I know she is going to love it! Yay!! It really was a good one!! Thanks, Natalie! I don’t think I’d miss the meat in this sauce either! Looks so good! This is definitely my kind of meatless meal! I love the lentils and mushrooms in the sauce! Looks incredible, Jess! I watched the film after a summer trip to Oregon. A friend, who calls herself a cheagan (cheating-vegan) told me about it. I felt the same way. I thought a bunch of fanatics at the beginning but so much of it made so much sense. Not ready to go full in (We live in Germany and the cheese is SO good), but I am happy to report that I have joined the ranks of cheagan-hood! This recipe is great. So fast and easy. We loved it. Thanks!